Do you need a Quick Mobile Bumper Repair ? 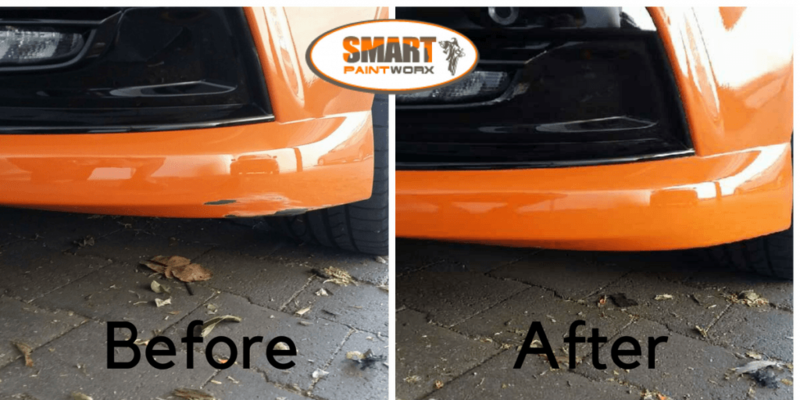 SMART Paintworx specialise in mobile bumper repairs , quick, affordable & superb quality. We will get back to you anywhere between 1 – 24 hours with your quote & if you are happy to proceed we can make a booking there & then. Generally we can have your bumper looking like new within 1 -2 weeks max during busy times. We can repair your bumper in as little time as 1.5 hours. Our aim is to have your vehicle looking like there was never a damage there in the first place. Therefore we guarantee all of our bumper repairs for two years, to give you peace of mind that your repair will be done professionally & to a high standard of quality. We use a SMART repair method – Keeping the cost down & the repair process easy. Pricing will normally fall well below your excess………………..
Small scuffs that have caused some minor paint damage can cost as low as $176 inc GST. Depending on colour, location & damage. Larger damages including some dents can be as low as $242 inc GST. Generally for minor damages the cost will be under $265 – Much lower than you insurance excess. Larger dents & cracks can range from $250-$400. Our qualified technicians will take good care with your vehicle ensuring that all precautions are taken to mask off the area & cover the vehicle so there is no chance of overspray occurring. They will sand back the area, use a small amount of filler if required, prep the area & spray, finishing with a clear coat. The vehicle will be ready to drive after the repair, we just ask that you avoid washing for 24-48 hours. For all quotes please send us the required information + close up & further back shots showing us where on the bumper its located. This entry was posted in QUICK Mobile Bumper Repairs and tagged Bumper Bar Damage, fast car repairs. Bookmark the permalink.